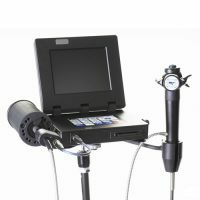 The new iTool Videoscope System incorporates technical, mechanical and software enhancements that will support many diversified industrial applications. This videoscope is ideal for aircraft turbine inspections, automotive inspections, gas turbine inspections, helicopter turbine inspections and others. iSeries UV Videoscopes have been specially developed to inspect cracks and leaks, using dye penetration testing, for example. Equipped with special Quartz light fibers and a UV objective lens, this UV-Videoscope in conjunction with the UV-Lightsource is an exceptional tool for every application in this area. 1. Supplied with one forward view objective lens ‐ 58 degree FOV F4 black (110‐0034). 2. Supplied with two forward view objective lenses ‐ 58 degree FOV F4 black (110‐0034) & 90 degree FOV F3 red (110‐0033). 3. All 90 degree side view tip adapters are supplied separately.